Witamy! Polish BBQ...for real? 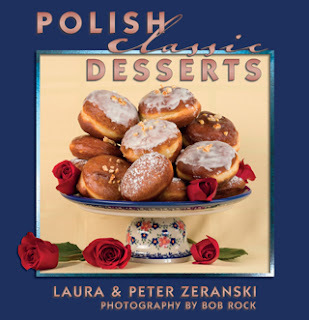 Other than grilling up big hunks of garlicky kielbasa, slathered with Cwikla – the iconic beets & horseradish garnish (Page 49 in “the book”), I’m not about to compete with your favorite American BBQ recipes and all those experts on the Food Network! But I do want to share with you that we have some fantastic salads and sides that will pair very well with your chicken, burgers or steaks, plus they’ll wow your guests. The marks of great picnic or tailgate dishes are that they can be prepared ahead of time, travel well, minimize slicing or dicing with a plastic knife from Costco on your plastic plate (also from Costco), and taste best at room temperature. One dish that meets those tests is Polish-style Deviled Eggs...one of my favorite outdoor dishes. This recipe has a very unique spin and will be a sure-fire hit - not to mention a great conversation piece. A day or so before the event, hard boil half a dozen eggs (tip: low & slow for max 15 minutes will keep the yellow yolks from turning gray); immediately cool the eggs in an ice water bath to stop the cooking process. Peel them and cut each egg in half length-wise. Take out the yolks while being careful not to rip the egg-white “shells.” Finely chop the yolks and mix in about 3 tablespoons of sour cream, 1 tablespoon of plain bread crumbs (Panko is great if you have some in your pantry), 1 tablespoon of fresh chopped dill, 1 tablespoon of finely chopped green onion, salt & pepper to taste. Place the mix back in the egg-white “shells,” sprinkle the tops generously with more bread crumbs, and flatten the tops with a knife. Now here’s the big twist...melt 3 tablespoons of butter (or healthier cooking oil) in a skillet and quickly sauté the eggs, flat side down, until golden brown. Pack them up in an airtight container and keep cool until time to serve. When serving you could sprinkle a little fresh, bright green, chopped dill on top, just for color. Now get out of the way because they’re going fast! YUM! Polish cuisine has some great salads that work surprisingly well with BBQ. Two of our favorites are Marinated Beet Salad (page 25 ) and Cucumber Salad (page 21). Samples of the Cucumber Salad were served at two of our recent book signings and tasters raved about the beautiful appearance and fresh taste. Another salad that works well on a picnic or any buffet table is Sauerkraut, Carrot and Apple Salad. It has a tang that is very refreshing and the interaction of flavors helps this salad pair really well with most meat dishes that don’t have a big sauce. Start with half a pound bag of good quality sauerkraut, rinse it really well and squeeze out as much of the liquid as possible (tip: I just press my fist into the colander...the point is to take out as much of the sharp packing brine as possible). Rinse and squeeze a second time and chop it up finely. Add two medium raw carrots that have been peeled and shredded. Add one large sweet red apple (Gala is a good choice) that has been peeled and shredded. (tip: a food processor will make quick work of these steps ). Add in a tablespoon of sugar and 3 tablespoons of a good, unflavored salad oil. Mix well, place in an airtight container and chill until ready to serve. Serves 4. There are many other salads and appetizers in Polish cuisine that work well at a picnic, tailgate or BBQ. Our book includes some of our favorites that have been proven successful and popular over many generations. Smacznego!